UPDATE: giveaway is now over. Thanks for participating. Did that get your attention? 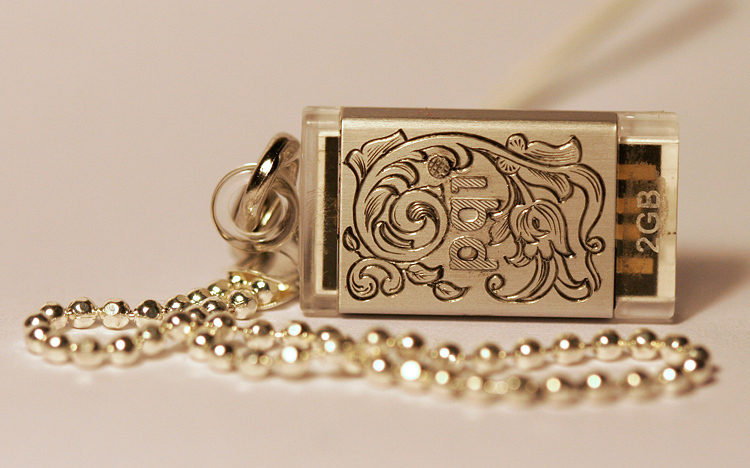 Good, because now is the chance to get free hand engraved 2GB USB memory stick. To participate simply leave a comment to this post stating “Me wants it” or anything with your email so I can contact the winner. On 21st of Nov 2008 I will pick a random commenter and send the memory stick to him/her. Commenting once is enough, thank you. This is what you are getting (measures 2.6×1.5cm). If you made this far into the post I must say that this stick was a testpiece to see how good it is to engrave one. Conclusion – not that good. The metal is extremely soft and it’s very hard to do fine engraving. Also, I use acetone for design transfer and this melts the plastic. You can see from photos the problematic places. But hey, it’s free and loaded with few of my knifemaking and engraving videos. Next victim is either iPod Shuffle or spoon… Hmm. I really like the design! It’s so graceful. “ME WANT IT”I like the idea of combined modern technology with classic craftsmanship. Me wants it, yeeesh!!! Näeb lahe välja. Graveerimine on midagi mis tundub minu mõistusele justkui midagi rasket, keerulist ja uskumatut. Aga ühte ma tean, asjad, mis on oma kätega tehtud, nendes on tegija hinge ja väge – need juskui kiirgavad. “Me wants it” Really I do..really really, I promise I want it…believe me already, I do want it very bad. Really! for a first try, I think it is gorgeous! Can’t wait to see more. did i say me wants it ? yes i did. me wants it NOW, now now now! 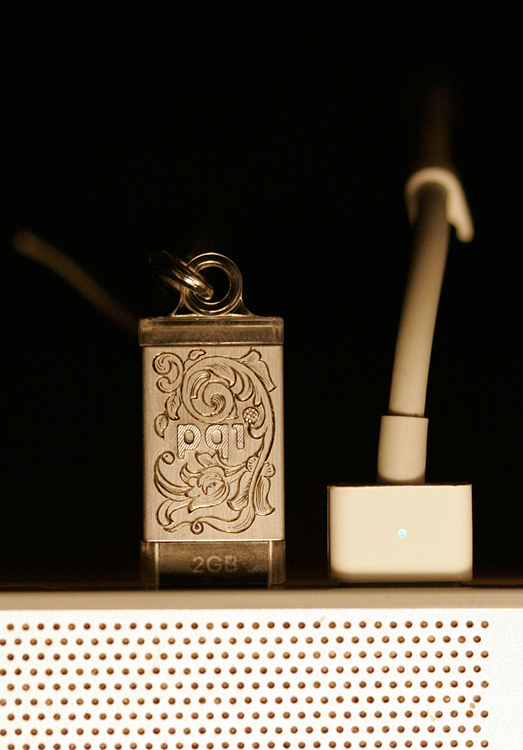 Haven’t ever seen such a engraved USB memory. Very nice work! Good stuff! Give it to me! Wow , super super, super. Me wants it and also engravement on my computer (so it looks more cool, yes). Even though I didn’t make it on time (I’m always late for the nice stuff :D) it doesn’t make it less beautiful! Great job, as always!